A lot of people experience poor mobile phone signal strength at home or at their workplace. Changing the phone numbers might not resolve the issue as there are several reasons related to not receiving strong mobile network connectivity such as the distance from the tower and the mobile phone device, obstructions between the mobile network tower and the mobile device such as buildings that decreases the mobile network frequency. The best solution to such situation where the usage of mobile phones are too important are by installing mobile network boosters. These boosters help the mobile devices in getting a strong mobile network no matter what obstructions are there in between. These boosters gather the available network and provide the mobile network with the stronger connectivity. Whether office or home, these boosters are the best suitable and preferred device for such problems. Generally, a mobile network has the ability to reach any long distance where there is no interference of any obstacle in between the mobile device and mobile network. But a situation where the signals have to travel through various buildings, it result in week signals strength. Materials such as concrete, wires, metal sidings as well as geographical elements such as trees, mountains have a great impact on the mobile network, thus resulting in poor reception of mobile network. Since, there are plenty of mobile network towers that are availed by the network providers so that every time a user travels from location to location, their mobile gets connected to the nearest tower to get strong signal strength. But once the user start reaching the outer limit from the network coverage area, the signal strength start to decline which result in no reception of calls, poor call quality and call drops. Such network problems are faced now days by everybody and due to this important call are missed. Engineers have been working on this is issue and have come up with such mobile network boosters and this device is the best solution one can adopt by which the poor network will be boosted to get the strongest network ever. No matter where you are facing such issues, home or office, the mobile boosters are easy to carry and install and on the top of it is the one time investment. The mobile network boosters come with an antenna that is placed outside the home or office. This antenna plays a significant role in reception of the signal from the network tower to the mobile device which enables to boost the signal on the mobile device and every signal issues by which you will be able to call without any worry of call drops or disturbance during the calls. 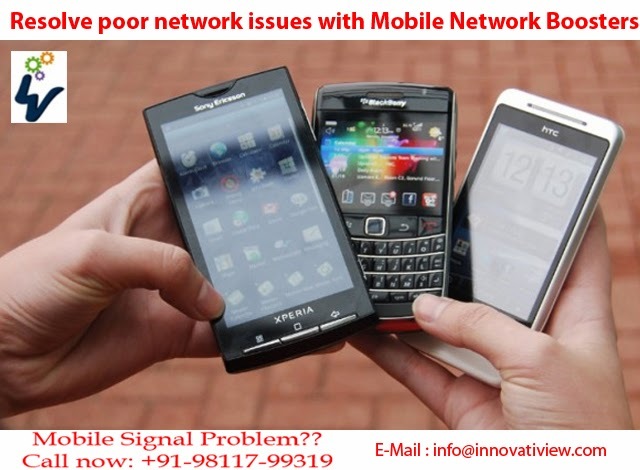 Innovatiview is a wireless solutions provider based in Delhi. Innovatiview has become today's market leader in the signal jamming and boosting industry.